1. Separate fresh wide rice noodles, making sure any clumps are separated. 2. Mince 3 cloves of garlic, slice the chicken into small bite sized pieces, and slice Gai Lan into 1.5 centimeter strips. 3. Heat a large wok on medium heat and add about 2 tablespoons of oil. Add garlic, fry the garlic for about 10 seconds until fragrant. 4. Add chopped chicken and stir fry for it about a minute until the chicken is no longer pink and cooked through. 5. 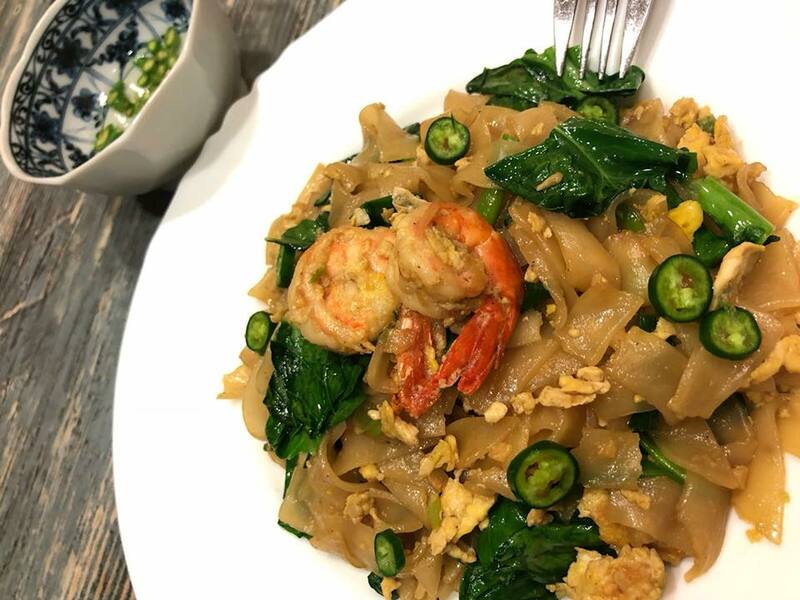 Now, turn down your heat, toss in the rice noodles, the Chinese broccoli, 1 tablespoon of light soy sauce, ½ tablespoon of dark soy sauce, and a ½ teaspoon of sugar. 6. Still on low heat, start to fold the noodles gently by picking them up with the spatula from the bottom, and folding them over. 7. After the noodles are well mixed, push the noodles to one side of the wok, and crack an egg on the other side. Increase heat to medium-high flame. 8. Scramble the egg, and then fold the noodles onto the egg. Let the heat sear the egg for a few seconds and then start folding the noodles and egg together. On medium-high flame, you should get a little char to both the noodles and the egg. 9. Fry for about 30 more seconds, making sure to be gentle with the noodles, and then turn off the heat and dish it out. 10. Sprinkle a little freshly ground pepper. And serve with a side of red chili flakes and some vinegar.